An independent study found that IE9 vastly outperforms other browsers in repelling malware. Many people like to hate on Microsoft for the bloated mess that its browser became in the mid 2000s. The decline of Internet Explorer led to a resurgence in competitors not seen by Microsoft since Netscape Navigator. Many PC users left IE in droves for the greener pastures of Firefox, Opera or Chrome (my personal favorite). With the rise of malware installed by unwitting people clicking on bad links, however, perhaps it's time to run back to Microsoft. 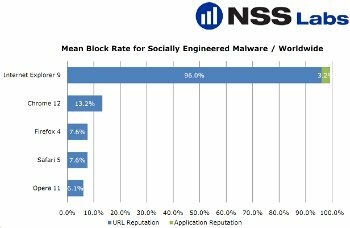 A study run by NSS Labs called "Web Browser Security: Socially-Engineered Malware Protection" compared Safari 5, Chrome 12, Internet Explorer 9, Firefox 4 and Opera 11. Out of all the latest versions of the most common browsers, NSS Labs found IE9 protected users against 99.2 percent of all possible attacks from malicious links. The runner up was Chrome, which only protected against 13.2 percent. That's a huge jump, people. 99.2% is way higher than 13.2%. I mean, it just is. "European and American users have found themselves particular targets of malware authors over the last 12 months. North America has consistently been the primary host of malicious URLs, while users in Asia have been victims of the greatest number of malicious URLs," the report reads. "IE9 with SmartScreen offers the best protection of any browser against socially engineered malware." While that almost sounds like a marketing spiel from Microsoft, NSS Labs' testing seems legitimately independent: "This report was produced as part of NSS Labs' independent testing information services. Leading vendors were invited to participate fully at no cost, and NSS Labs received no vendor funding to produce this report." The report also seemed vigorous, testing the browsers for a full 14 days each before collating all of the data. I know, I'm as amazed as you are. I use Chrome because of its easy features and small UI footprint and I know not to click on random links that might look suspicious, but if you have a grandmother or Auntie Sue who can't make such a judgement call, you could do a lot worse than making sure their laptop is running the most updated version of Internet Explorer. I ... I can't believe I just said that.